COVER ONLY with concealed Zipper. These beautiful Cotton Twill indoor throw pillows can have one design front and back, or you can designate a different design on each side. Available in a variety of other sizes. 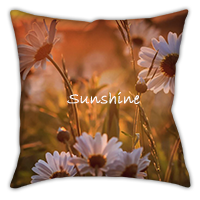 Double-sided print throw pillow, polyester poplin material with recycled down alternative fill is easy to spot clean. Made in the USA.